I love this time of year when spring hits full and bright and the children are all aglow from the excitement of the upcoming holidays. Easter is a big deal around here and we celebrate the resurrection in many different ways. In our class we spend time studying the resurrection eggs. The children love taking turns opening eggs and discussing the story behind the item inside. This helps them develop long term memories about the order of the resurrection story. We also colored, cut, and pasted items in our resurrection story book. 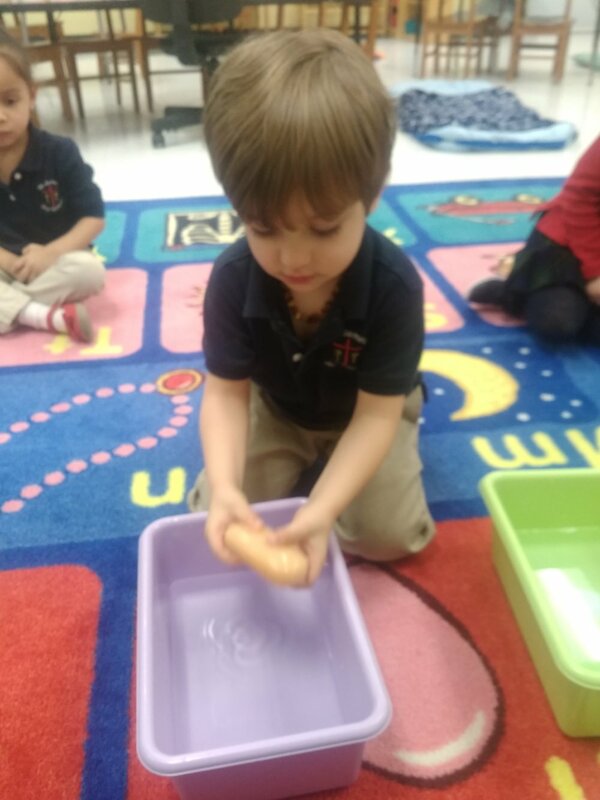 Children learn best through hands on activities and repetition so our book follows the same outline as our eggs. The children had a blast working on the books and the eggs but they really enjoyed wrapping up our Easter week festivities with a class party. The children didn’t let the rainy weather put a damper on their spirit instead they hunted eggs in the classroom, played bingo, and visited with the Easter Bunny. Another fun experience that I really like during our Spring semester is our butterflies. We set this activity up to be as inviting and interest grabbing as possible. Child led, interest based activities are incredibly effective at this age. Nothing quite grabs their attention like watching the metamorphosis of a butterfly as it is absolutely amazing to the children. We practiced our numbers by counting how many caterpillars formed a Chrysalis and then by counting how many butterflies emerged from their Chrysalis. This year the children were very amazed that all the caterpillars made it through the process - many times this is not a guarantee. During the course of our investigation the children develop different cognitive connections. Not only did we utilize math with our current counting skills but we also introduced the rather abstract concept of a cyclical life cycle. Then we used art and photographs to study the symmetry of butterfly wings. The children worked on vocabulary by learning new words such as symmetry, Chrysalis, and Metamorphosis. We introduced some basic Social Studies by discussing the difference between native and non-native species and used our technology to allow us to travel around the world to view butterflies from different countries. I was even able to use the empty Chrysalis to give an extra visual to Christ’s empty tomb. All in all this was a very busy few weeks for our little ones but the interesting thing for them was that they really didn’t know how much they were learning. When the learning takes place in such a low pressure play centered way we are able to reduce the stress on the children and increase their development. I hope you all have a wonderful Easter break and I look forward to sharing the last of our studies with you over the next few weeks. I’d like to take a quick moment to brag a bit about our school and our children. It has been a very quick and busy few weeks here on campus. However, I am so proud of all of our students. As Spring picks up we move into many, many activities this has the potential to seem overwhelming yet all I have seen is hard work and laughter. 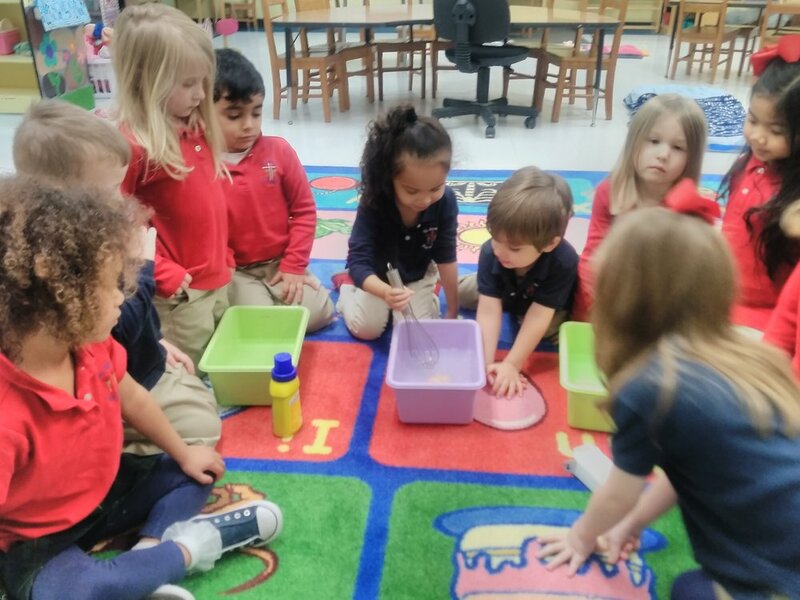 The Pre-K is getting ready for their annual talent show and Kindergarten is working on their graduation. Even the older kids are bustling with activity from the Science Olympiad to the Spring Musical. This joy and energy is one of the best things about our School because it is shared through all the grades including my little ones. Our older children recently put on a Science & Engineering Festival and even our younger children were included. 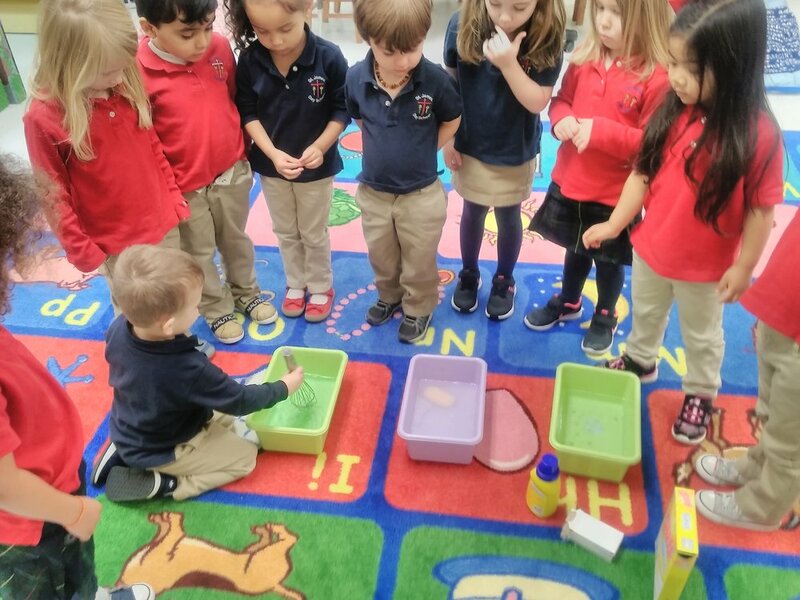 The children were able to have a wonderful hands on experience with science while observing our older children successfully create these exhibits. Now here’s my soap box for a minute, High School dropout rates have been studied extensively across the country and this is clearly a multifaceted problem. However, it has been demonstrated time and again that Early Childhood and Elementary Education have a major impact on the outcome of a Highschool graduate. Campuses that have an engaging interactive supporting Elementary with access to older successful students have higher student success rates. I believe that is one of the blessings here at St. James. No matter how long you are here you get the opportunity to see older students persevere through many different subjects. This past week my class learned more than just science from these older students they learned kindness, wisdom, joy of learning, leadership, teamwork, and perseverance. It just warms my heart to see all the wonderful learning that takes place on our campus and before I move on I invite you to check out the statistics of our students who leave our program. We have high standards and high success rates because we make large investments in our students lives no matter what age they are. The Science & Engineering Festival was also a great support of our Building study. The students had a blast discussing their ideas about what they had seen and experienced. Building on this joy I set up several invitation areas for them to work on creating their own buildings. My wonderfully smart engineers went right to work using toothpicks, marshmallows, jelly beans, gum drops, cups, and blocks to build wonderful creations. It was truly exciting to see the thought processes that the children went through to figure out how to make their buildings stand up. We also learned about emotional control as we had to deal with the failure of not always being able to make what we wanted to successfully. As they say though there is a rainbow after every storm and the joy that shows on a child’s face once they accomplish their task is amazing. In order to have a good foundation you need to focus on more than one area of study. I’ve mentioned our handwriting curriculum before but we also branch out in other ways. For example we are now raising caterpillars as a science study about the life cycle of butterflies. We use technology to show the children some wonderful videos about the life cycle and then they were able to actually observe many of the traits in real life using our caterpillars. Our caterpillars are now in their Chrysalis stage of life and I am so excited to say that our children understand and can use this term at 3 & 4 yrs of age. Nothing can really replace hands on learning. Stay tuned to see the results from our caterpillar study. See you next time! Our class has moved into our building study. This study is always a blast for the kids. They love building and construction and I love the way that social studies is wrapped up so neatly in the curriculum. As always we started our exploration discussing what we already know about buildings and then we moved into what we want to find out. During this discuss we introduced the book Three Little Pigs. The children loved the story and pretending they were the big bad wolf on the playground. We counted the doors and windows in our room, in our building and in other buildings around our campus. We moved into our first investigation by drawing a map on the board and discussing the buildings in our campus neighborhood. At this age the terms map and neighborhood can be new concepts that they are still struggling to understand. Using our beautiful campus as a neighborhood allows the children to add a visual to accompany their newfound knowledge. Once we had discussed the map we planned a “tour” of our campus. 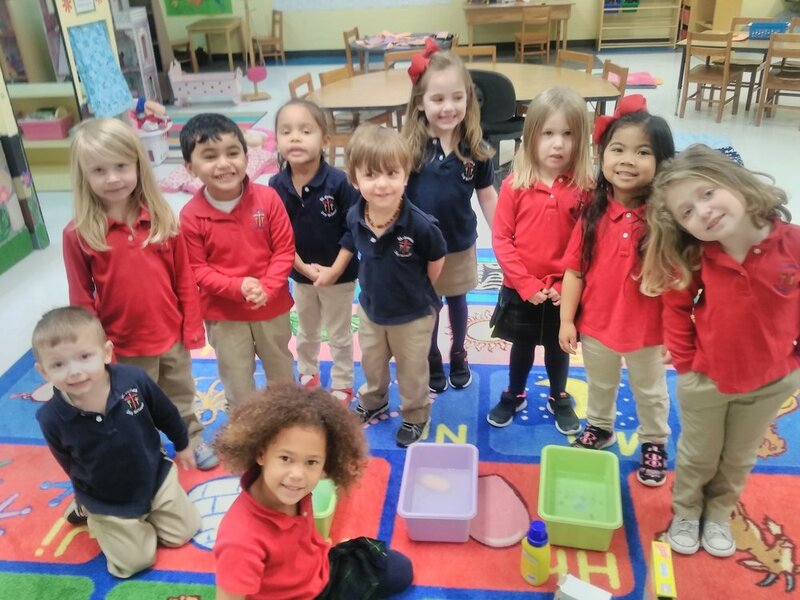 The children walked around the campus as we discussed the order of buildings, shapes of windows/doors/roofs, and the features we found inside different buildings. The children loved seeing the stairs and fireplace that are a part of our administration building. Of course we always like to differentiate and incorporate different learning concepts within our curriculum. So we also used our sense of hearing to learn about the buildings around our campus and what kinds of noises we could near different buildings. We used our hands to measure the different sizes of bricks used to discuss which buildings had larger bricks. Then we wrapped up our tour with counting how many cinder blocks tall our building was and we compared this with how tall we are in cinder blocks. Aside from our building study we have been hard at work continuing to build a good foundation with our fine motor skills. We have cut, painted, and colored. These fine motor skills are now becoming a big part of the children’s lives. Throughout the year I work with the children to grow their knowledge of letters using our Handwriting Without Tears curriculum. We also work on their name and recognizing their special letters. This hard work comes in the form of play with tiles, colors, phonetic songs, and even playdough. At this time of year we combine that knowledge base with those fine motor skills to help them learn to write their name. At this point now the children are signing in every morning with a dry erase marker (which is super cool to them). In fact, several of them have begun to also write their name on their own coloring sheets and other work without being asked. I love sharing in their joy when they write one of their special letters all by themselves. It truly is excited watching the children grow happily in their confidence and skills. These types of questions allow us to increase vocabulary, guide inquisitive natures, and combine multiple subjects in fun learning environments. After discussing laundromats, sorting clothes, and types of soap we wrapped up this study with an experiment. I asked the children to make predictions on which type of soap would make the most suds. They were given the choice of powder, bar, and liquid. This type of prediction can be very difficult at this age as some children don’t like to risk failure. However, failure is an important part of the scientific process. The children did wonderful and we introduced the mathematical concept of tally marks for tracking our predictions. 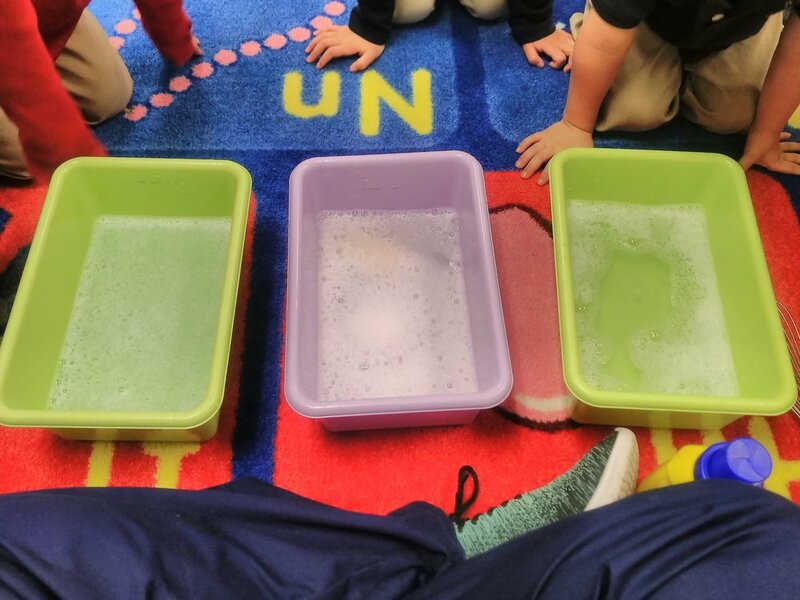 The children had a blast pouring water and mixing soap. We ended up with two interesting findings. 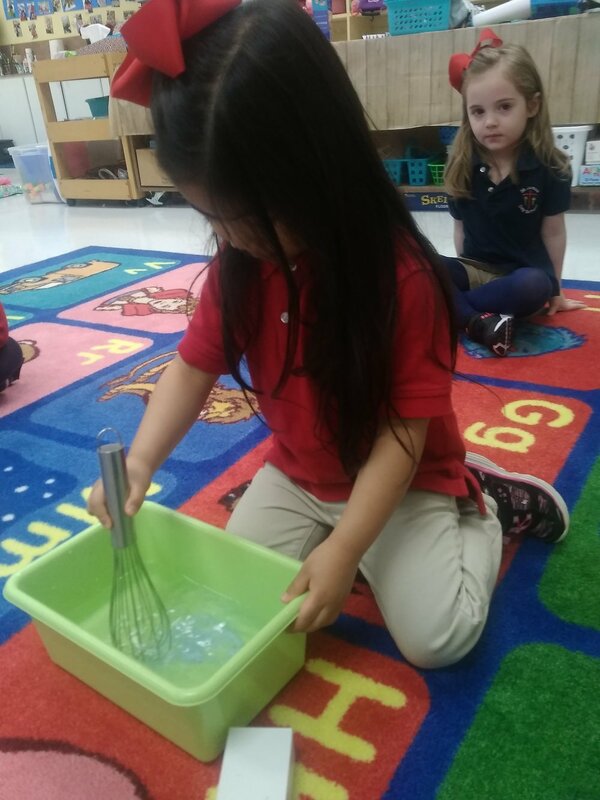 First when only the children stirred our result was the liquid soap had the most bubbles. However, I asked the children if they noticed anything different about the mixing of each tub. I had two children point out that the children stirred differently. This lead to a discussion of speed and its relation to the amount of bubbles. The children really enjoyed this experiment and I loved seeing how their thought processes have developed since the beginning of the year. Along with our normal curriculum we love to throw in fun activities for the children. These WOW Experiences really help connect the children’s investigations during class time with real life by creating exciting positive memories of learning. Our most recent WOW Experience was a visit with the tooth fairy. The children learned about how to care for their teeth and how to make healthy food choices. We also sat and discussed the tooth fairy’s clothing and how we thought it would affect her job. It was a very intriguing topic for the children as they were amazed by her dress and the tools that she used with her job. We have also begun to make trips to the Library for reading time. The children love traveling along our beautiful campus to the “white house” that contains our Library. We read many books throughout our day but it is always enjoyable to see, touch, and hear other adults also reading. Reading aloud to children is one of the highest predictors of language development and future reading success. The wonderful things is that our Library trips are so much fun that the children don’t even realize all they are learning! LET'S GO SEE OUR GRANDPARENTS! It’s everyone’s favorite time here at St. James - Grandparents’ Day. It’s the day that we celebrate family and all that we do at St. James for the children. This day is a program day and a day to share all that the children have learned so far this year. 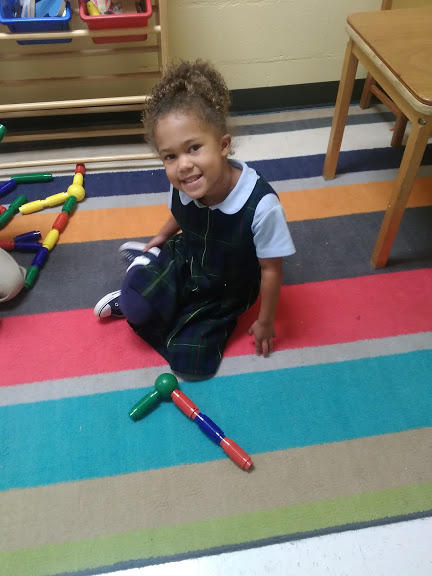 St. James Day School is a unique environment where children are encouraged to learn at developmentally appropriate levels with differentiated learning. It’s not always about the facts - math, english, history and science; instead we also develop honesty, integrity, compassion, consideration, and biblical knowledge. We study the arts and music alongside STEM and then we throw in a lesson on how to love your neighbor. Our children had a wonderful couple of weeks leading up to today. 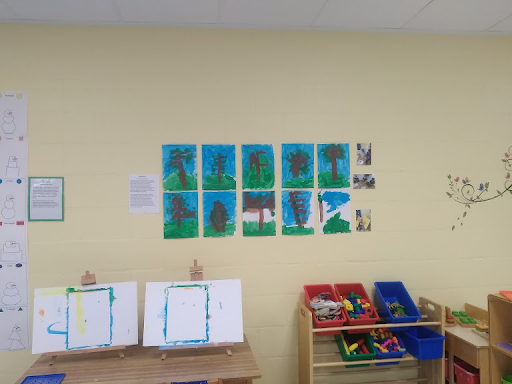 They worked on learning songs and on creating some wonderful artwork showcasing the hands-on work that they have been studying all year. We had a wonderful Valentines’ party on Thursday and then the children sang their songs perfectly during our Grandparents’ Day program. It is very difficult for children to get up on stage in front of a large group of people, and all of the children handled this process perfectly. 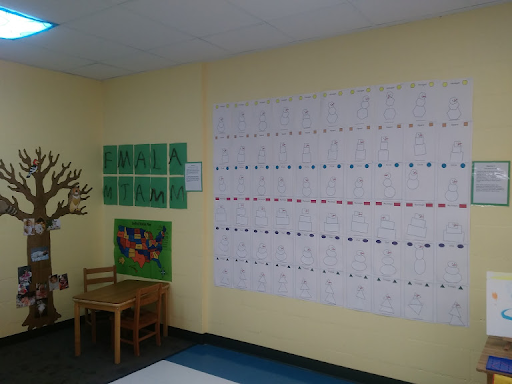 They are all such wonderful children and I would like to share with you some photos from the past few weeks that show off some of our unique learning styles. I also would like to share some of what our room looks like. Please enjoy these lovely faces and know that we are so blessed to have them in our school.